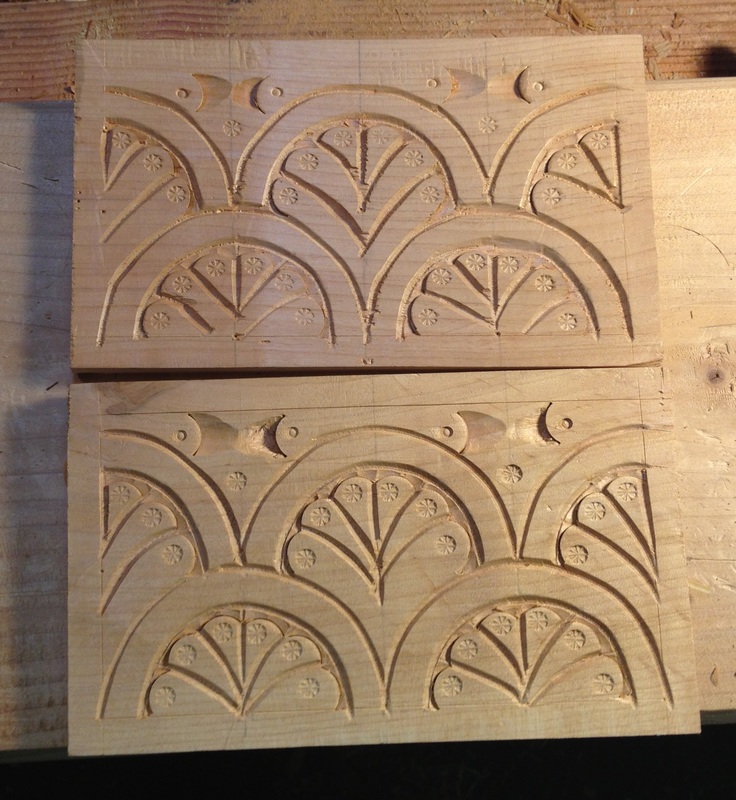 Finished Carving – My version of the PF/Savell pattern. I took some liberties with the pattern, making it my own which was partially dictated by the tools I have and width and characteristics of the Alder. 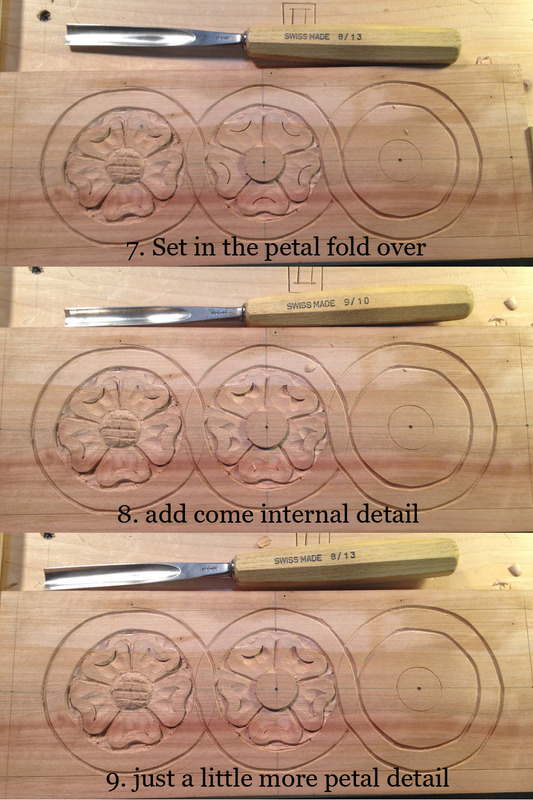 Based on all the images I’ve pored over, comparing patterns by the same maker, or from the same shop I think this is pretty much how the period craftsman did it. This pattern is laid on a square grid due to the arcs that are the basis for this pattern. To find this scale, I laid out the long center-line, and the short center-line as usual, and used my dividers to find a spacing that worked which took a few tries to get right. I started with one point in the center and put the other near the top in what looked like a decent border for the edge. The first attempt was somewhere in the neighborhood of 1/2″, and when I walked this down the length to the end. The first attempt ended up roughly halfway to the end, so I adjusted the arm a little bit, and did it again until I found a measurement that looked right at the end and the top margin. Pricking the top and bottom margin first, I used my marking gauge to set these in with the scratch point. Then I walked this out again along the center-line, pricking the board deep enough to leave a mark. 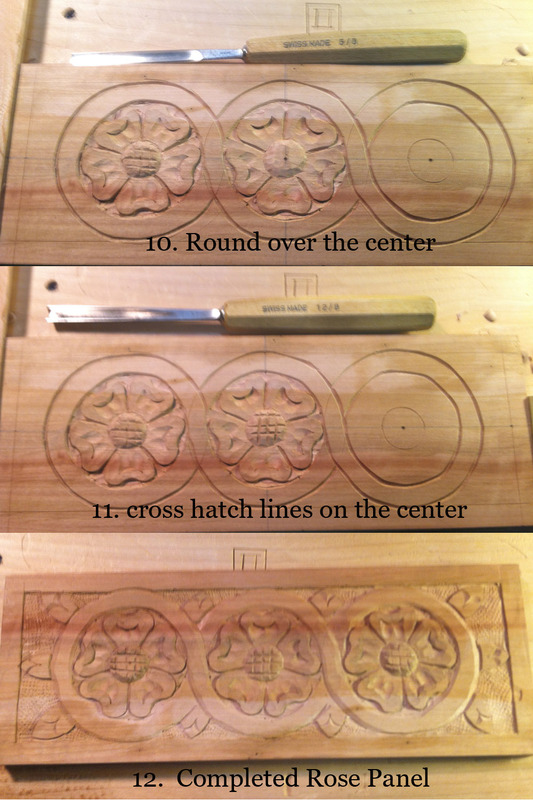 Finally I used my square and awl to scratch a line at each of these points to complete the layout. To create the arcs, I picked a point along the center and with my dividers scratched a half circle onto the top half. Leaving the point in the wood I scratched the bottom half, then repeat all the way down doing the top and bottom half. (Really, go by Follansbee’s video, he does a better job explaining this). Next it’s a simple matter to set in the fleur portion at the points where the half circles meet. I used small deep gouge first for the underside of the fleur, then followed by a bigger slightly less deep gouge to make the leaves. Remove the background with a small flat gouge, and bevel the outside of the top arc. Finish with the texture punch on the inside, and add come half moon gouge cuts to the top, followed by a nail punch accent just for kicks. 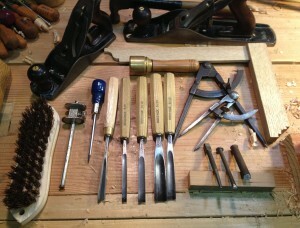 Here are the tools I used in this carving. Three more panels to go! Since I had finished up the previous panel last week, I started on the second panel while taking a break from the family that had invaded our house. Invaded is a bit of strong word, since I do enjoy their company but I wanted to make some progress on this project. I didn’t spend much time documenting this one, so all you get is my finished photo this time. You can see the previous panel in the back, and the new S-Scroll panel in the foreground. I will be doing a different pattern on each of the six panels for this project just for fun, and showing off. Also, to get more practice at each of these styles. Speaking of practice, all the effort I had spent on previous panels paid off this time. I started out with my standard scribe lines and thought I was going to do a different panel, a sort of “arcs and fleurs” pattern. However, I realized I had laid it out wrong! But I was able to simply switch to another pattern since many of them share a common layout of rectangles. The other pattern will be next, and I’ll be a little less cavalier about the layout this time. The S-Scroll pattern I did here was a simplified version of a pattern I had done before, and was dictated as always by “the point of the tool”. I had laid out the rectangles, evenly divided by finding my center lines both vertical and horizontal as well as eyeballing a good margin. Then I stepped off from the middle with a pair of dividers till I got something looked about right. The ease in which I am able to do this (once I had let go of my ruler) has absolutely convinced me that its what craftsmen of old did. It just makes sense and is quite efficient with surprisingly little practice. After finding the center line of the rectangles I marked some arcs with a divider to mark the end of the S shape. 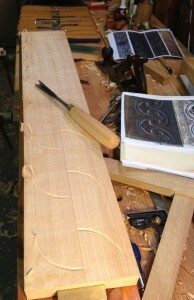 Then I picked up chisels till I had one that fit the arc well enough, and struck the half circles in. 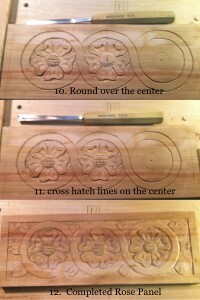 Then I sketched right on the wood to get an idea of how it would look, and then started fitting chisels to the sketch. 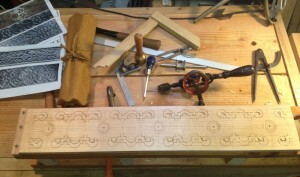 The outside lines are struck in with chisels, and the center of each S is done with the V tool. All in all I used about 4-5 chisels of various sizes and curves to set in the outline, and two flat gouges small and medium to relieve the background. Once I had the background relieved I used my home made texture punches and gave the background some texture. Couple swipes of the smoother and voila! All in all I think I was down there less than two hours, which made me feel good. I was able to recover from my layout mistake and come up with a simple quick pattern and execute it in an afternoon. That felt pretty good, I gotta say. It’s been a rough few months in terms of getting any woodworking in. My work is going like gang-busters right now, and I’ve got a lot going on inside my head (my job is pretty mentally intensive) which is exhausting at times. 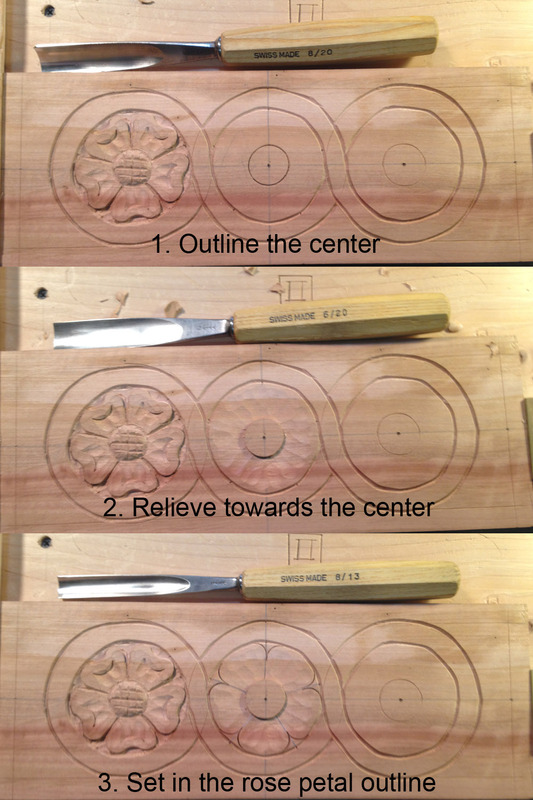 This new project is going to be part carving pattern practice and demonstration, and part functional tool box for carrying tools out of my garage. I’m going for one of those six sided tool boxes seen in the Toolboxes book by Jim Tolpin. I’ve been fascinated by that for a while, and while it might not be “strictly necessary” because I have a nice carved tool tote… I just kind of want one. And I wanted some more carving, so there ya go. Starting with some Alder wood that I picked up previously from Coyote I dressed the edges and face till it was reasonably flat and true. Since I’m going to carve it I don’t really need to make it mirror smooth, but the Alder does plane up nicely with my fore plane. Taking the concept of the “design at the point of the tool” I placed my crosscut saw down, padded it by a little bit, and called that the length after accounting for the wood panels at the end. I don’t really need to measure it out since I know it will be big enough for my longest travelling tool. I won’t be able to put my longer rip saw in it, but it’s not something I usually travel with and would make it far too long and cumbersome. 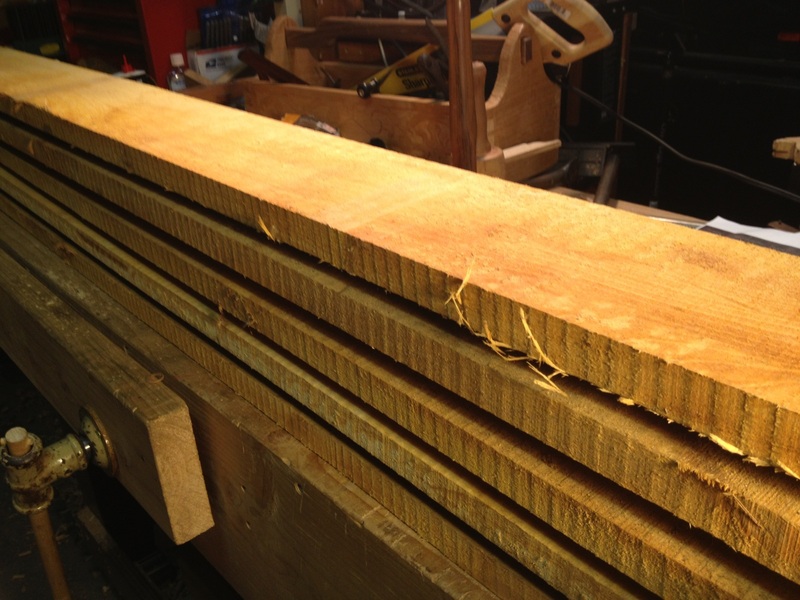 Alder boards – one prepped and planed the other still in the rough. Since this will be a six sided box I’m going to do a different carving design on each side as part practice and part demonstration of period styles. 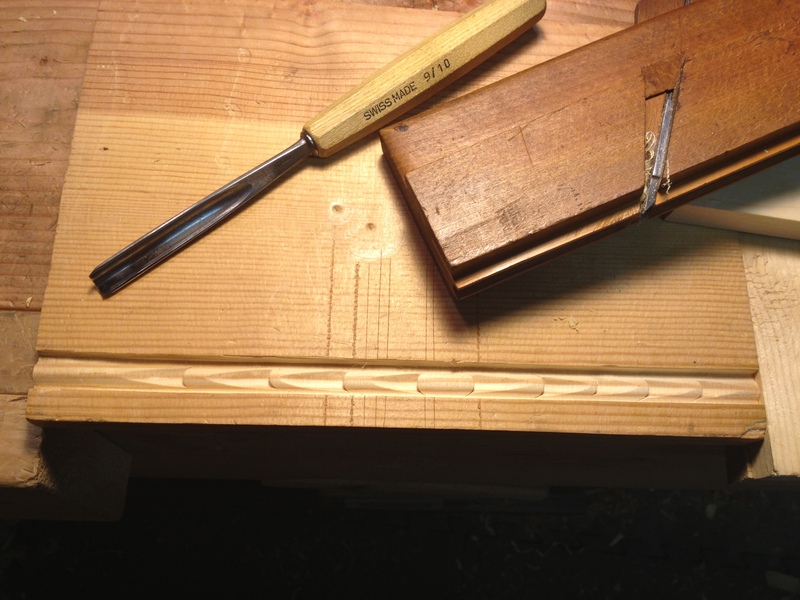 To layout the pattern I struck a line with my awl down the middle and length. Then I used my dividers to pace out some divisions. 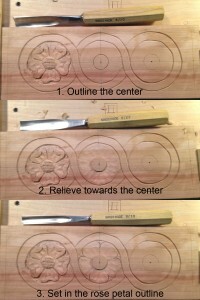 This part is a bit subjective but as long as I base the layout from the center it tends to work out just fine. This design uses a square as it’s base unit so I started with a division based on roughly a half inch from the top and bottom, and then paced that out along the length. The first few times it was too short or too long, but I kept tweaking it until I had a nice balance between how much border it left at the top/bottom edges, and how far in from the ends it was. Again, no idea what measurement this is, and I don’t need to. 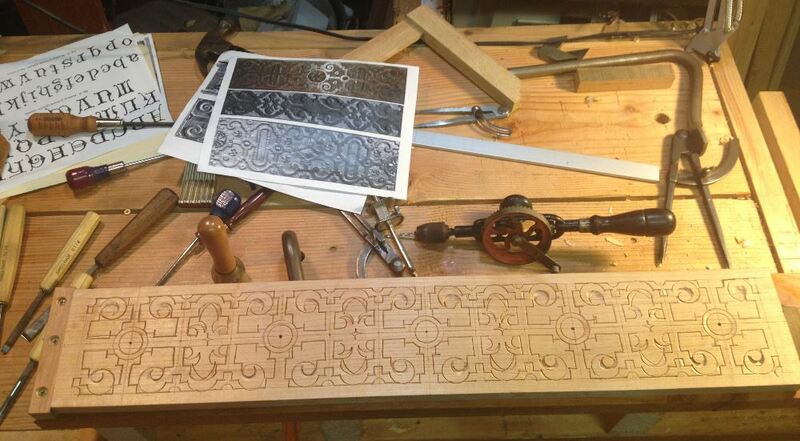 I pricked the length down the board, and scratched in the horizontal layout lines with my awl and square. 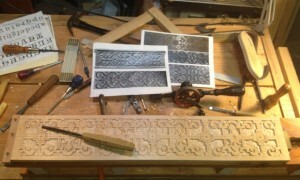 First part of the layout done with a start on the setting in phase of the carving. You can see the starting point for one of the distinguishing features of “strapwork” with the curls. I was not copying a specific pattern here, but rather using a few print outs of designs from existing period boxes and chests I have in my archives. The I use my chisels as layout tools to set in the designs. This time I didn’t sketch anything out in advance as I have done in past designs, and in some ways it worked out but it was a struggle at times to work things out. I think I was mostly successful though, and with more practice it would be almost effortless. 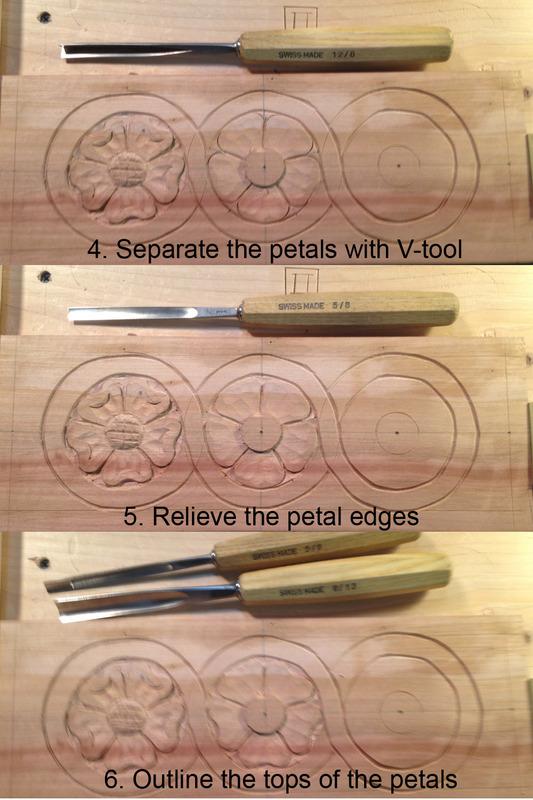 I tried it this way because I have a theory about the period craftsman I wanted to validate. I think they didn’t have templates and the like, they just started with layout lines and a pattern they learned from their Master or the shop, and just adjusted it to fit their stock. I kept going along this way, figuring out the design on one of sections and then going down the line setting it in. Once I figured out the chisels that would make the pattern I wanted I would hold the tool in the same position and walk backwards down the board striking it in sequence. 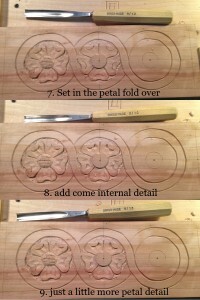 I picked this up from Peter’s video on S Scroll carving, and was very helpful for this longer pattern. After that it’s time to grab my small flattish gouge and start relieving background. Here is where I discovered a flaw in my design. The little curls have a circular section in the middle that liked to pop out constantly. I’ve had to re-glue in almost every one as it would come flying out as I tried to carve away the background around it. Something in the way I struck the line, and the relative lightness of the wood. I’ll be finishing this up and starting on the second panel in a bit, hopefully this weekend. I recently picked this DVD up from Chris’s blog when he was blowing out his copies for blog readers, and wanted to throw up a quick review. By the way, if you’re wondering where I’ve been on the blog, it’s been a combination of really heavy work schedule and family summer vacations that have kept me out of the shop recently. Short version: Well worth the pick up even if you’re not interested in power tool woodworking, and is a great starting point for hybrid woodworkers to dip their tow into the hand tool waters. This 2.5 hour video starts out with a simple premise, to teach you how to build a traditional style tool chest in a short amount of time using a blend of hand tools and power tools with home center materials. And, in my opinion it does exactly what it says on the box. However, it also does something a bit more more than that. 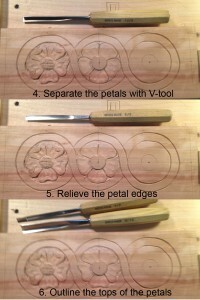 As a hand tool woodworker, I’m all about the traditional methods and sources. The value for me in this video is in the information he presents in addition to the construction details. He shows several old tool chests, and how they were constructed which was quite fascinating on it’s own. He also spends time talking about the choices he makes in construction which gives me great ideas on how I want to build my own. And at the end he shows off the “Dutch” tool chest, and talks about the benefits of both the traditional and “Dutch” style chests, including how to pack your tools and division of the insides. These bits alone are worth the price of the DVD for me with the information being presented well and easy to absorb. The construction of the chest itself is well produced, and Chris and helper Ty do a good job of presenting the material. If you’re new to this stuff, it makes you want to build stuff and feel like you could actually do it. The really subversive part of the DVD comes in how he introduces some hand tools to the mix and starts you thinking down the path of how hand tools can be integrated into your shop. All in all, worth price and worth picking up for the information and discussion on tool chest design. I picked up a center bead plane from Josh over at Hyperkitten Tools, and tuned it up this afternoon. The blade unfortunately had one of the two groove points messed up. I wasn’t sure if I was going to be able to fix it, but I gave it a go. I ground it on my coarse and medium oilstones and got the two groove blades in decent shape, but I had to take so much metal the center beading part of the blade was fairly shallow. I had a medium curved oilstone and was able to take some metal away in the center, while keeping the rounded area sharp. Putting it into the plane body though, the blade profile did not match the sole any more. I took a risk and planed the boxing down slightly with my smoothing plane. It brought the profile back into a decent enough match, and putting it too wood it cut a decent bead. Which brings me to the decorative molding carving, which was why I bought this plane in the first place. I was surprised at how easily this carved, even in crap Pine. 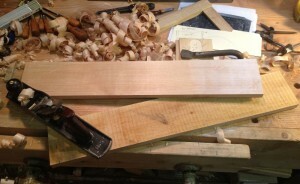 The molding is something I picked up from Peter Follansbee, and it’s really quite easy. A straight vertical stab down with a gouge that matches the bead, on the center of bead. Then a downward sloping push cut into the back of the stab cut and out pops a little chip. 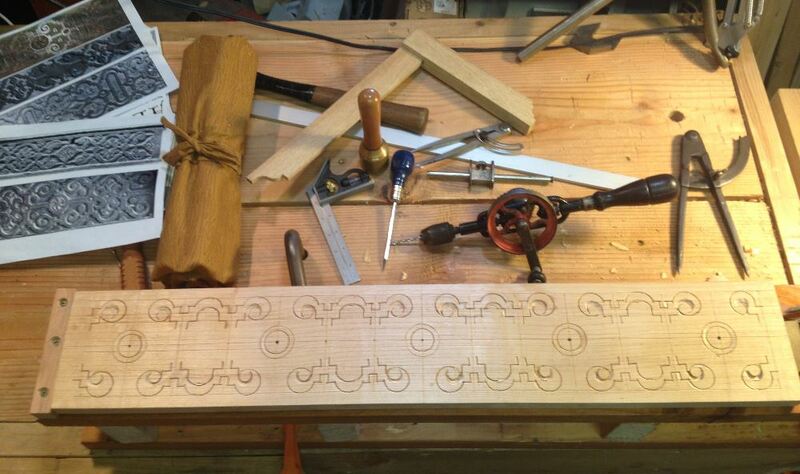 Repeat this down the length of the bead evenly spaced in a single direction, or in opposing direction and you have a great decorative molding. It does some near stuff with light and shadow. After getting back from the Coyote wood shop with the new planks, and letting them acclimate for a while I thought I’d get acquainted… Well, I also thought I’d get my wisdom teeth removed, and then recover in time for a major crap storm at work, and then I thought I’d get some carving done. Anyway, I also had a new V chisel to try out that I picked up at the Lie Nielson event. They are selling the new Auriou carving chisels designed in partnership with Chris Pye. I didn’t intend to buy one, but after picking it up and feeling how good it felt… well I just had to. After rough planing, and ripping a small chunk of Alder to two 1/2″ planks I decided I would revisit a carving pattern I had used before. It is mostly V-tool work, so it was a good introduction to the tool. The chisel feels good in the hand, but the heel is a lot lower angled so I have to get used to a new grip and posture with the tool. It went in deep at the angle I was used to with my Pfiel “Swiss Made” chisel. It also needed a quick sharpening on the Translucent Arkansas and strop. The top panel is the chisel right out of the box, the lower panel is after a quick pass on the stone and strop. Alder carving tests with new chisel. 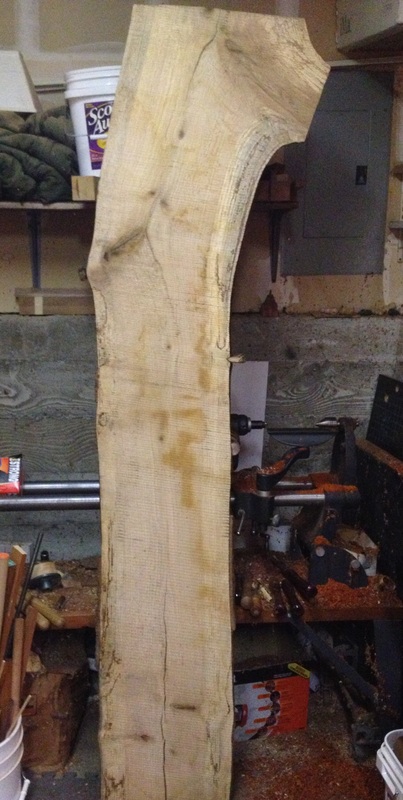 The alder is a bit light, and I want to try a different section of the board before I decide how much I like this wood. So far the jury is still out. 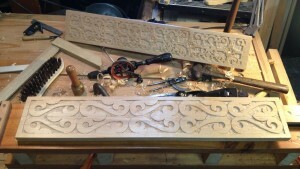 The chisel is a fine tool, and once I got used to it it was pretty nice to use. I’ve been looking around for a local mill, preferably one that handled urban harvested woods. 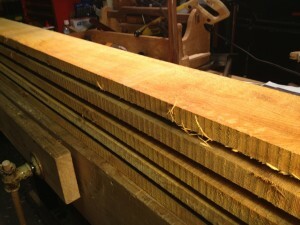 I found the Coyote Woodshop through a web search and reached out to the owner to see what he could offer me. David was very nice, and knowledgeable about the subject and on his invitation we set a trip out to visit his place out on Bainbridge Island. (For those not local, it’s a quick ferry boat ride over the Sound.) 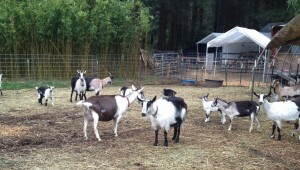 Also, there was a promise of baby goats for the kiddo, so we made a family day trip out of it. After a tasty lunch at the Hitchcock Deli we headed down the road to check out David’s place. It was probably 15 minute out of town, so local people should check this place out because it’s really much closer than I thought it would be. David met us and sent me off to visit the wood shop while he pulled a pie out of the oven. I snapped a few pictures of the wood shop and drooled over some of the woods he had available. He has a nice selection of local woods all ready for amazing projects. Then we discussed what I’d come for, which was Alder for making a few carved boxes. He took me out to his air dry shed, and we uncovered a big stickered pile of Alder that had been drying for two years. Air dried carved better than kiln dried, and Alder carves well so this was a great find. 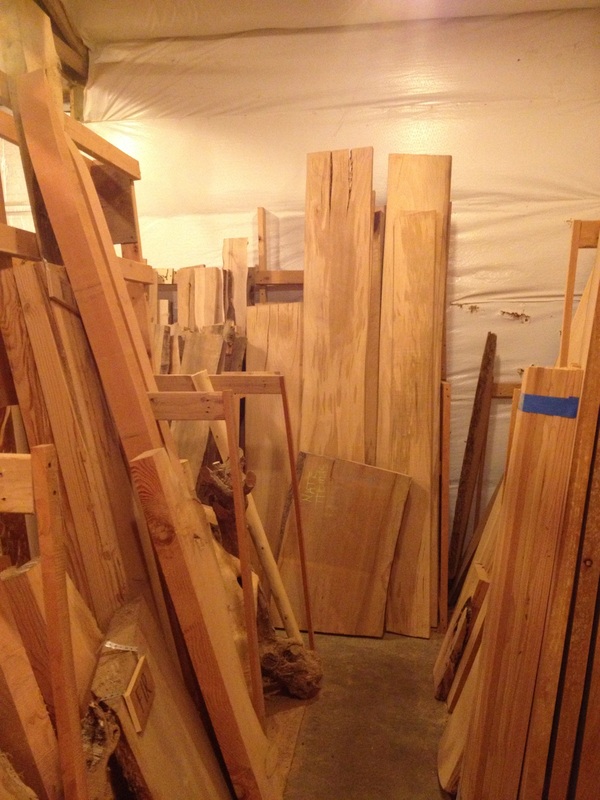 I pulled five boards 1″ x 6″ x 6′ and he showed me some White Oak he had next to it. I pulled a quarter-sawn chunk to take home and try out carving on. 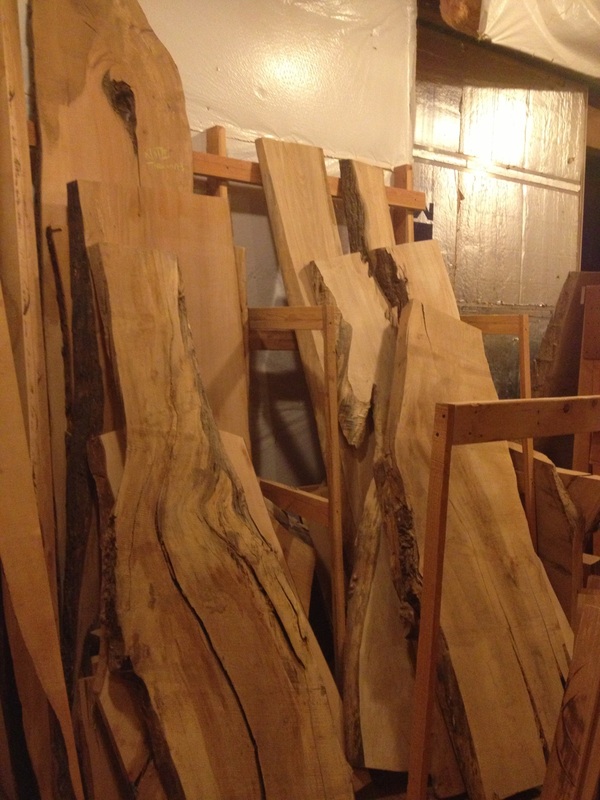 I’ve got them acclimating in my shop right now, and I’m hoping to get some time this weekend to breakdown one of the Alder boards into some usable chunks and start dressing it. On a related note, I was able to acquire a vintage scrub plane from Josh over at Hyperkitten tools to help in the stock preparation. It was a nice trip for the family, and I got some locally harvested air dried wood for carving. 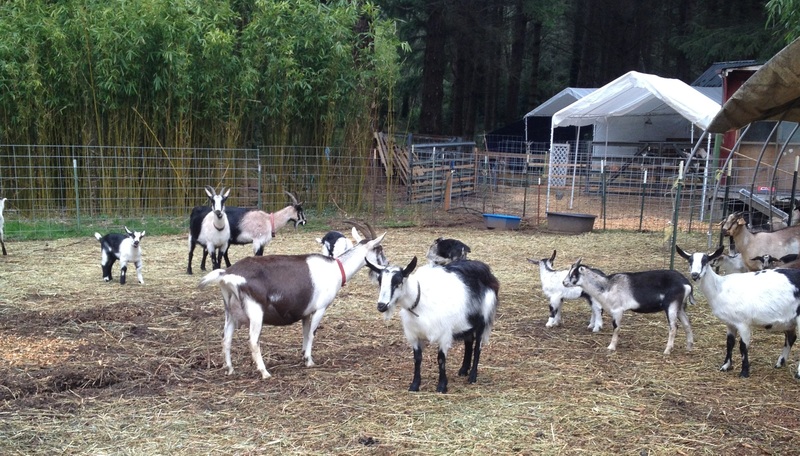 I read on Peter Follansbee’s blog that the attendance for his two classes at Port Townsend might get cancelled because not enough people are signed up!?! 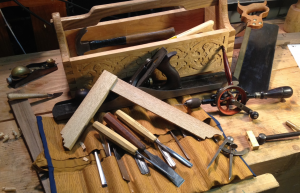 Hey MWA folks and any other PNW woodworkers, you should think about these classes! 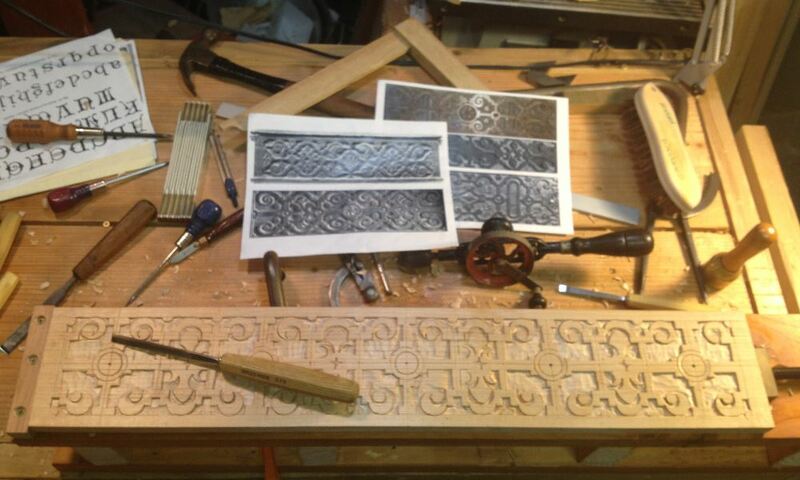 Peter Follansbee is one of the most knowledgeable guys out there for 17th century carving. If you have any interest at all, it would be well worth the time and money to attend, as I doubt he’s going to make his way out here again. I’ve already signed up ages ago, and will be majorly disappointed if this gets cancelled. Please spread the word! Tell your friends! I’ve been hoping to get a chance to meet Peter and learn from him since I started reading his blog. It started me down the path of carving, and is a major reason why I’ve been able to figure out the stuff I’ve done lately. It’s been a bit since I’ve updated the blog due to a variety of reasons including a minor surgery that had a rough recovery. I have been working the wood in the shop, just not posting here. I have at least two other major posts I will be adding as I catch including one on my sons 6 board chest build, some finished carved boxes, and a couple shop made tools. But for now, I want to share this bit of carving I did on Saturday which I think came out really nicely. I also took some step by step shots of the progression as a demonstration of how easy it really was to do. As I worked on the first one I worked out the steps I needed and then captured a shot of the tool used to do each of the dozen or so steps to complete a single rose. Then I put them together “Kari Hultman Style“. Some of the shots were blurry, sorry about that I was grabbing these quickly with my iPhone and getting back to work. If you have any questions about which tool or want to know more about a step I took let me know. I hope it’s somewhat self evident what each step is. Badger Woodworks: The year in review. By the numbers I wrote 25 posts (not counting this one) in 2012 on a variety of topics. I made a turning bow saw, a carved tool tote, marking gauge based on a period example, a six board tool chest for my son and two traditional carved storage boxes (which I will post final pictures of next year). Not all of these things got posted to the blog, mostly because I don’t really have a good set up for taking quality photos yet. This year was all about the carving for me, as I took strong leaps forward in terms of skill and knowledge in the area of traditional 17th century carving. I’ve been doing a lot of reading on the subject, and am considering a fairly large project this next year in this mental arena. We’ll see, I’m not going to commit to it yet, because based on my post history my time to work on projects is fairly limited. IF I feel like I can pull it off, it will involve a lot of writing, something I’m not great at so we shall see. Use of nails. I’ve been trying to use cut nails in my box work, but have some issues with splitting or chipping on boards. I’m building my skills with traditional nailing, and nailed furniture but I have a long way to go. More carving practice. Lots more practice, I really am hoping to make a half dozen traditional carved boxes next year so I can learn some of the lessons that only come with practice. Shop made tools. I want to make a few more tools for my shop including a panel gauge, shooting board, and winding sticks. 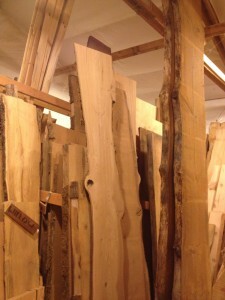 I also have two classes coming up in 2013 at the Port Townsend School of Woodworking that I am very much looking forward to. That’s the plan, who knows how it will hold up. I’m not making any resolutions, because I don’t believe in making grandiose sweeping proclamations that I will never achieve. I do make plans, and set reachable goals but don’t call them resolutions. Happy New Year! and I wish all of you a big year of woodworking in 2013!